Are Your Children’s College Education Funds Protected From Your Creditors? | The Kaiser Law Firm, P.C. Many parents and grandparents establish 529 Plans to invest money on a tax-deferred basis for their children’s or grandchildren’s college or post-graduate educational expenses. However, for those of you who are residents of the State of Missouri, it is important to take additional steps to protect and secure your children’s and grandchildren’s college education funds that are held in a 529 account. Unlike qualified retirement plans (401K plans), IRA and Roth IRA’s which offer certain protections pursuant to the Missouri homestead statutes, there is no protection afforded to 529 accounts from creditor claims of the account owner. Accordingly, if the account owner is faced with a judgment creditor, the judgment creditor has the ability to attach the 529 account to satisfy their judgment, a result which could be devastating to you and your loved ones. Federal law provides some protection for Missouri residents who are owners of 529 accounts if the account owner is in bankruptcy. Absent a bankruptcy, Missouri residents who are owners of 529 accounts (whether such accounts are MOST accounts or another states college savings plan) are exposed to losing their 529 accounts to a judgment creditor! Missouri’s 529 college savings plan (MOST)--as well as most other state college savings plans--allow a trust to be the owner of a 529 college savings plan. 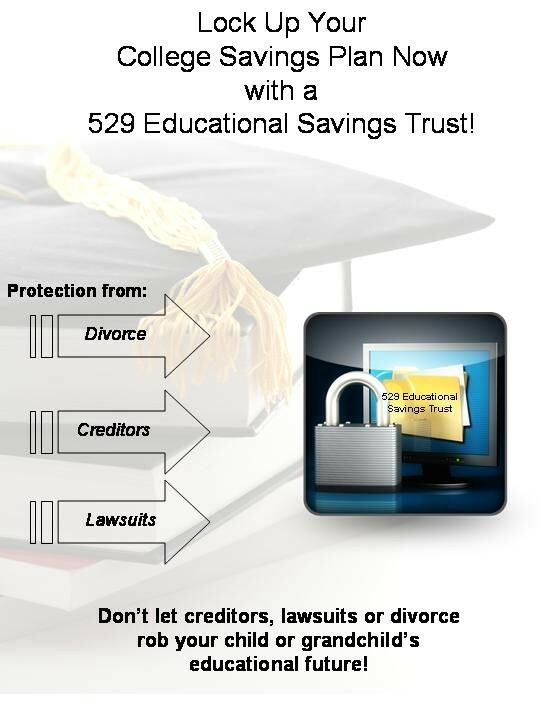 The combination of a 529 college savings plan and a specially designed 529 Educational Trust can provide divorce and creditor protections and allow the client to retain the ability to use the funds in a financial emergency. In addition, the client can move the asset between siblings (or other family members) to meet the client’s planning objectives. College savings plans are touted, often appropriately, for their tax deferral and other benefits of saving for college costs. However, it is important to sit down with your estate planning attorney to make sure that the ownership of these plans correctly carries out your planning objectives. If you are concerned about asset protection, estate taxes, control and other issues then you should consider a 529 Educational Savings Trust. Please call our office to find out more about the 529 College Educational Savings Trust – 314-966-7766.